The Mirro Aluminum Company was once the world’s largest manufacturer of aluminum cookware, and for years Mirro Plant #3, built in 1929, was a center of Mirro manufacturing in Manitowoc, Wisconsin. Production ceased in the building in the early 60s, and more recently the structure seemed to be dying a slow death, with only the first floor occupied. Now, though, Mirro Plant #3 has been reborn as Artist Lofts, a 40-unit, 2- and 3-bedroom apartment building. Windows from Graham Architectural Products (GAP) overcame a key challenge in helping to bring about the transformation. Graham’s SR6700 – a steel replica window that brings modern performance to the classic look of windows commonly installed in mills and factories throughout much of the 20th century – proved to be the ideal solution. All told, the project required over 300 of Graham’s SR6700 windows in 12 different sizes. In addition, Graham created a custom interior three-dimensional muntin, as well as a custom subsill that simplified the installation process and ensured weather-tight performance. 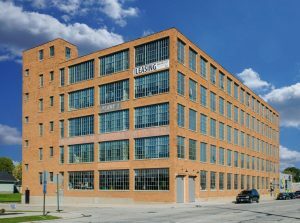 In the end, Artist Lofts received over $3 million in federal and state historic tax credits. Those credits are paying off. According to Impact Seven, it’s the highest-rated energy efficient multi-family green development in the history of the Wisconsin Green Built Home program. It also won a Neighborhood Development Award from Progress Lakeshore, a regional economic development organization, and is now listed in the National and Wisconsin Registers of Historic Places.